Def Leppard, Jeff Beck, The Struts and Cheap Trick were among the big winners at the Classic Rock Roll Of Honour today. The ceremony was held in Japan for the first time ever, with the spiritual home of Sumo wrestling Ryogoku Kokugikan Stadium in Tokyo packed with 8000 rock fans for the star-studded event. The sold-out crowd watched performances from Jeff Beck, Joe Perry, Rudolf Schenker, Johnny Depp, Phil Collen, Richie Sambora and Orianthi, Tesla, Cheap Trick, and a house band made up of Rob and Dean DeLeo from Stone Temple Pilots, Korn drummer Ray Luzier and Tommy Hendriksen of Hollywood Vampires. Hosted by Megadeth frontman Dave Mustaine, the celebration saw Jeff Beck presented with The Icon award by Led Zeppelin hero Jimmy Page, while Scorpions man Rudolf Schenker presented Richie Sambora with the Classic Songwriter prize. Def Leppard scooped the fan-voted Album Of The Year prize for their self-titled album and Queen’s The Studio Collection took the gong for Reissue Of The Year, also voted for by the fans. Jeff Lynne’s ELO were voted Band Of The Year by the fans, while X Japan mainman Yoshiki was named The Asian Icon. One Ok Rock were named Eastern Breakthrough Male Band and The Struts were voted Best New Band by fans. Band-Maid took the Japan Next Generation prize. There were performance awards for Slot Machine and Sarah Geronimo, while an All-Star Band led by Jeff Beck and featuring members of Stone Temple Pilots and Hollywood Vampires man Johnny Depp performed live at the sold-out venue. TeamRock Chief Executive Billy Anderson says: “It was a bold move to take the Classic Rock Roll Of Honour to Japan for the first time and we are delighted that it has been such a huge success. “The lineup put together for the sell-out crowd who flocked to the Ryogoku Kokugikan Stadium was spectacular and every one of them will remember this night for years to come. We truly made history with this lineup. “Jeff Beck, Cheap Trick, Richie Sambora, Queen, Jeff Lynne’s ELO, Yoshiki and Def Leppard are truly worthy winners and we continue to champion up-and-coming bands, with The Struts taking the Best New Band prize. “And playing host to some incredible performances by some of the best rock acts in Asia will hopefully help bring these exciting artists to a new audience. Katsuya Kobayashi, Yoshiki, One Ok Rock and Band-Maid gave the show something very special. 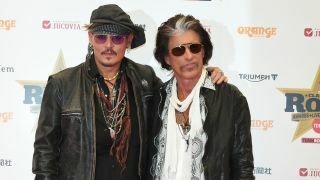 “Seeing Johnny Depp and Jeff Beck up there with members of Stone Temple Pilots as part of the house band was a sight few would have imagined seeing. The full list of winners can be viewed below.